It was by all accounts a wintry evening at the pit. The recent snows had firmed up now, from the bone chilling cold. Crispy sounding to walk on, like Styrofoam on a cold kitchen floor. 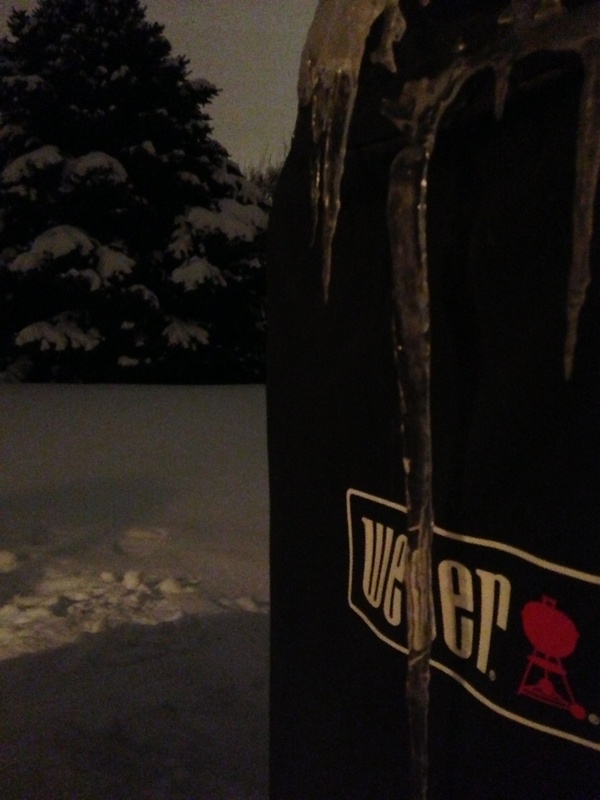 Tentacles of ice adhere like winter weeds to the faithful Weber water smoker, whilst the chill winds swirled from a darkened sky. The moon hung stoically behind a soft veil of gray, barely leaking through, scarcely there it seemed, as a night-light to the heavens. And the aromatic plumes of cherry wood smoke bellowed forth from an active pit, one of which I huddled dear to, this cold, winter’s eve in Minnesota. On the grill tonight, an old staple – the hamburger. Now every grill keeper worth their tongs has sought to conquer this section of the menu. It is what most of us started out with, or cut our teeth on, so-to-speak. And no faction of the grilling arts, perhaps, says more about your grilling style, than the humble burger. Want to get a better idea of a grill jockey’s mojo, consider first his hamburger. It is a pit keeper’s thumb print. For instance, what ratio ground beef is used? Or is it just a frozen, mass-produced patty? Is there anything inside the burger?Are the buns toasted? Would your Grand mother be proud of your hamburger? 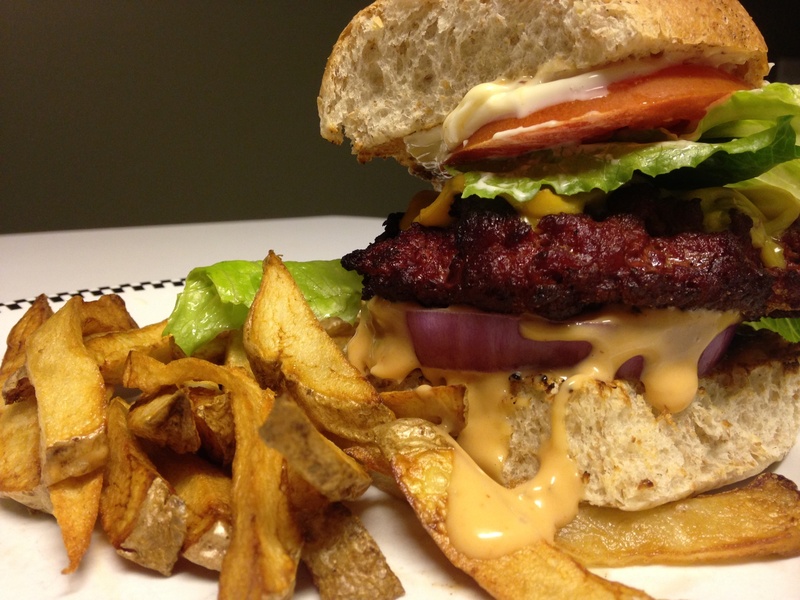 We love a good burger here at the pit. But then, who doesn’t. It’s an American way of life, hamburgers are, like the venerable, and ever-iconic, Big Mac. You know the jingle, “Two all-beef patties, special sauce, lettuce, cheese, pickles, onions – on a sesame seed bun“. A few years back, I was loitering in the shadow of the infamous golden arches, where I had re-acquainted myself with their flagship burger. By golly, I thunk, the burger wouldn’t be half bad if it were done proper like, out on the pit that is. Surely with a few altercations, and a little tweaking, hark, it might even be a pleasant, yet reasonable experience. And so, after the passage of several years, I finally got around to making my own Big Mac – PotP style of course. I guess I sort of changed most everything about it, save for the special sauce, but man did it turn out! So grab a lovely beverage and settle in for a spell, and we will tell you a little more how it was done, and how it came to be, this the culinary remake of a franchise burger. To start with, no frozen patties here, folks. But that is a given among our readership, for you all are reasonable folk when it comes to your hamburgers. Never would you render your innate craft so low as for the seductive, frozen pucks stacked like poker chips in the back recesses of your refrigerator. Never! We used a pound 80/20 ground beef from a local farm, raised drug-free on the cool plains of Minnesota. Now the Big Mac has two patties, but that is just likely a marketing gimmick if you ask us. Why have two patties when one, half-pound “proper-sized patty” will do just fine. Mercy! So we formed a couple of manly patties, lightly seasoned in garlic and onion salt. Next we brought them out to the grill, which was already puffing away. Here is where the metal meets the meat concerning burger-craft, and moreover, what separates you from the indoor chef – and that is smoke. Most folk don’t think to smoke their hamburgers, but let it be said, because its true, they are also missing something out of their lives. Oak would be an excellent choice here iffin you have the means. Likewise, hickory or even mesquite if you go lightly. What we used however, and with great effect, was a baseball-sized chunk of cherry wood, which was just the trick for these husky beef patties. 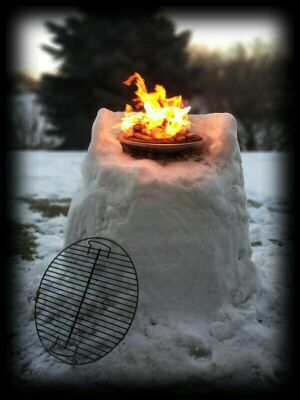 We placed them opposite the hot coals the entire time, never once exposing them to direct heat. The idea was to take them slowly, and infuse a good matter of smokey goodness that which every pit keeper and kin alike, crave. Lid on, burgers in-direct, cherry wood smoke lightly puffing through the dampers, glory! The heck with the winter time blues, for there is no such thing patron to a well-loved pit. It’s token fiery bosom is well enough to keep us warm, if not but for our passionate resolve as well. 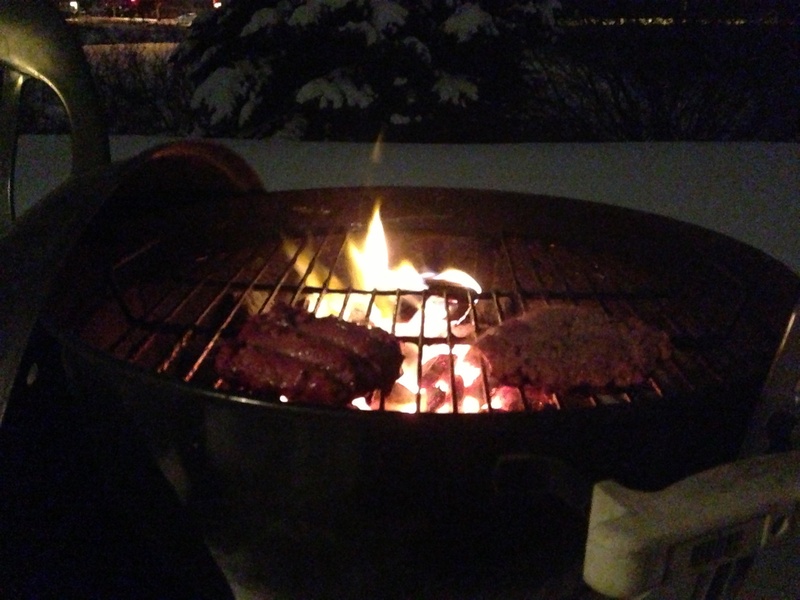 Bank those embers tall boys, for neither ice, nor snow, nor the dark of night will keep us from our appointed BBQ! Anyways, and with modest fanfare, prepare your buns with a light buttering. Whilst you’re at it, slice a tomato nice and thick, and like-wise with a good red onion, and a pickle, if you’re into that sort of thing. Chop a hunk of lettuce to size. Get your favorite cheese sliced and ready to roll too, along with your very best accompaniments. And then, when the time is right, deploy the “special sauce“. The big mac is known for its signature sauce. A little mayonnaise mixed with sweet pickle relish and yellow mustard whisked together with vinegar, garlic powder, onion powder and paprika. Or if you’re feeling a wee bit lazy, like we were, Thousand Island salad dressing will of course do the trick too. Whence the burgers have pooled somewhat, in other words, juices have collected atop the patties, and/or they have engaged in a mild curl or sorts, flip them over, still opposite the hot coals. Toss on some more smoke wood if you need to, and let them finish up there, at their leisure, until firm to the tong, or your desired interpretation of the word done. Lastly, toast the buns accordingly, and dutifully, for this is your song, people, your triumph in hamburger technology! So make it count, and take some pride in your spoils. And when all of this is done, and you have supped another inch off your favorite beverage, roll up your sleeves, patrons, and assemble then your masterpiece. Indeed, be inclined. So next time you’re thinking of swinging into the golden arches for a big mac, don’t. Rest assured, you can do better, a world better indeed, patron to the pit. And if your wife makes homemade french fries, all the better. Amen. The Big Mac, PotP style. Cherry smoked, loaded, sloppy-run-down -your-arm-goodness on a toasted bun and sided with homemade french fries. Buddy! This entry was posted on January 2, 2014 by Patrons of the Pit. 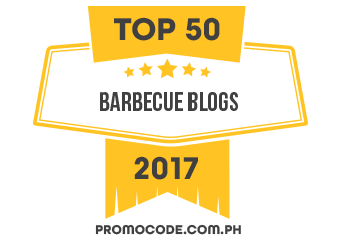 It was filed under Uncategorized and was tagged with bbq, big mac, burgers, cooking, food, foodie, grilling, hamburgers, outdoors, poetry, prose, smoked, writing. Hey if all you do is burgers on the grill, that is still a good thing indeed! My turkey burgers and pork chops! 🙂 and, the beans, veggies, corn… you know, the usual suspects! You have ridden this trusty steed well. Love the oozy cheese. I always liked big mac have enjoyed one occasionally, like yours MUCH better, who wouldn’t. Happy New Year! Happy New Year, Suzanne! Thanks much! Happy New Year, o’ Patrons of the Pit. Thanks TJ, back at you! Just read through this post and several previous editions. A baby the size of a brisket? Gotta love it! Your writing style is an absolute delight (as are your methods and recipes), and your poetic meat musings made me want to fire up the big ol’ smoker in our front yard post haste. It looks similar to yours, but has one of those secondary wood chambers (or whatever it’s called) and truthfully, we were thinking of selling it. (Sacrilege, I know… especially when we don’t have to shovel snow to get to it.) You’ve given me hope and inspiration to passionately pursue the pit. Thank you! Wow, thank you very much. You have much quality in your comments! Glad you enjoyed some things about the place here, and feel at least a little inspired. The smoker box, that’s what it called. 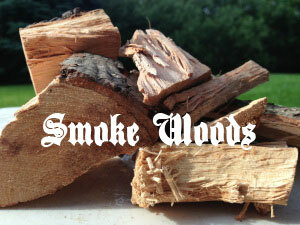 Your secondary wood chamber. That is how you get the low and slow thing going, patron to authentic BBQ. That old grill likely has many more years left in it, and it awaits your courtship! No worries, we’ll wipe it up! I approve wholeheartedly. Smoked burger is a winner. However, setting the Golden Lard Arches up as the opposition will always be an easy win. They disgust me…. True, it was an unfair competition from the start, we admit that! Wow, you make grilling a burger sound like a work of art! And your writing is! Your mama must have raised you right! HA! That she did! Thanks! I think the Big Mac wishes it would be this burger! That burger looks awesome. Great idea. Yours gives whole new meaning to the “Mac”. Looks so good! Haha, oh man it was so good. I’d eat it every day if I could. But I wont! It may be best if you do not. I recently tried (restaurant) burger with a fried egg on it. I’m not sure I can eat another burger without one. Oh my gosh! We are burgered and fried OUT after three weeks with our two nephews, who are 11 and 13! They HAD to “take us” to all of their favorite joints, ALL of them. I think we’ve gained 20 pounds! Ah yes that is prime burger consuming age! Sounds like you all had yourselves a grand time. Specially the nephews ! No more burgers for you tho! Greetings Amigo and … HAPPY NEW YEAR!! I hope your Christmas holiday was full of family and good cheer. I have been on the sidelines with my musings for almost a month now … first it was my computer that let me down … then, we were blessed with a power outage due to the massive ice storm we were smacked with just before Christmas. Not looking for pity but just to let you know I am taking a wee break because the ol’ Holiday budget just doesn’t include a new computer for moi … *sigh*. Be well my Smokie friend and I’ll be back … stay hungry !! Hey hey and greetings and Happy New Year unto you! No worries, man. I pity you not, for that is good story fodder! And tho computers may break down and electricity may go away, ain’t it nice how the BBQ grill always works. Ever stalwart! Even so, I hope you got your electrons moving again, because, well, its kind of cold out right now. Yes … 5 very frosty days w/o heat, hydro and running water … when the lights finally came back on on Christmas Eve, my Marital equivalent and I felt very blessed. Ran right out and bought a generator … although, … we may never have need of it again, I’ll be ready if we do. Be well Smokie friend. Oh yes, a smokey taste to a burger is fantastic. Always worth it. Thanks Liz! You are a poet in the pit! Well thank you kindly, Cookie. I like to grill. And I like to write about it. So it works out pretty well, most days.